Zombie fiction is one of those very odd little sub-genres that you either get it or you don't. Those that don't get it often roll their eyes and wonder how many different ways can you unleash a zombie apocalypse on the world before it gets formulaic. To be honest, there is little about zombie fiction that isn't formulaic, but that really is the point. Zombie fiction is never really about the plot itself. It's about the characters reaction to the plot they are trapped in. But you need to be a fan of zombie fiction to understand that. And if you are, then Dead Men (and Women) Walking is definitely for you. 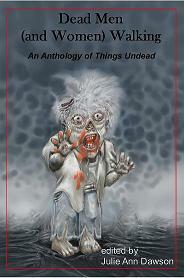 This collection of two dozen stories includes a few cameos by vampires and other types of undead, but it's really the zombies that get top billing. But before non-zombie fans stop reading this review, they should know that this book actually does find a few new ways to present zombie tales with a fresh spin, making it an entertaining read for horror fans in general. The collection opens, not with a screaming, bloodthirsty tale of zombie mayhem, but with two subdued yet very creepy poems of the undead by Guy Belleranti. In fact, it is the subtleness in the poems that sets the reader up for the emotional roller coaster of the first story in the book, Alexander Zelenyj's "Adam and Eve Versus the Human Race." Anyone who has ever read a zombie story knows how this one is going to end, but that knowledge of the end doesn't make it any less heartbreaking. The horror of the story doesn't revolve around the gore of watching zombies eat people. Instead, the horror lies with the slow decay of the protagonists' humanity as they struggle to survive. And in one desperate attempt to hold on to the last flicker of humanity, they pay a terrible price. The editors did a good job of laying out the stories to really pull the readers in a lot of directions emotionally. Stories like Josh Benton's "Waking Finnegan" and Arthur Sanchez's "Old Habit, New Habits" are entertaining and wickedly funny spins on the zombie motif, while David Bartlett's "A New Year's Tale" affords us an intriguing story of sacrifice and salvation. And Patricia A. Collins' "Alone in the Dark" provides a predictable, but still satisfying, vampire story of false innocence.